Banking By Cell Phone: Right Call For You? A growing number of banks is encouraging customers to pay their bills, manage their accounts, and use other services from their cell phones. The current issue of Consumer Reports Money Adviser discusses cell phone banking and whether it's right for everyone. Adviser Executive Editor Greg Daugherty told The Early Show's Russ Mitchell Tuesday cell phone banking has only "been around about since the beginning of the year. But I think most consumers are probably hearing about it just about now." Why would someone want to bank by cell phone? Basically, Daugherty says, convenience. For instance, "If you travel a lot, most of us have a cell phone with us even though we may not have our computer with us. You may not know where the nearest ATM is, that kind of thing. Travel, just convenience in general, late hours you can use it. They're probably safer than using that computer in the hotel lobby that you don't know who's going on after you that might be able to get your passwords." And he predicted cell phone banking would get increasingly popular: "I think it really will. I think the convenience - everybody's got a cell phone." What's more, most banks don't charge for cell phone banking - yet. But they may add fees at some point, Daugherty says. One disadvantage, he observed, is that, "It's like online banking, but it's on that itty-bitty screen, the little keys. So, a lot of people are going to find it difficult to do in a way. But people who are sending text messages all the time … they'll probably be perfectly at home doing it." Meaning, Mitchell asked, young people will be the majority of early adapters? "They'll probably be first," Daugherty answered, "but the rest of us will be along shortly." To get started, check with your bank. You'll have to have Web access from your cell phone. And some banks require that you download their software. Also check to see whether your phone is compatible with your bank's service. In most cases, it probably will be, Daugherty says. According to the Consumer Adviser, "AT&T says that it plans to include banking and other financial software with most of its new phones. 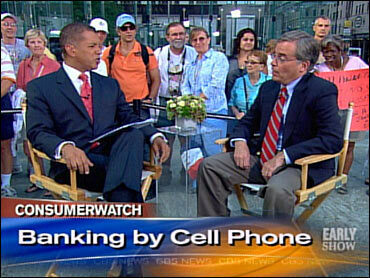 The company has agreed with Wachovia Corp. and other institutions to offer banking services to its cellular customers." Daugherty pointed out that, among the things consumers can do from their cell phones is check their transactions, "which can be really helpful for people who overdraw their accounts a lot and find those $30 overdraft fees on their bank statements every month." In addition, many banks send alerts to cell phones advising consumers when their balance is running low, bills are due, etc. So far, Daugherty says, cell phone banking is "very secure. They've got all kinds of passwords and encrypted things and so forth. You can figure the crooks are probably working on it right now, and there will be dangers to be concerned about, but I think, generally speaking, it seems pretty safe." Polices vary bank by bank, Daugherty noted, on customer liability if there's a security problem with cell phone banking. "People should check with their banks," he advised. "Some banks have zero liability policies, which means, if something goes wrong, the bank will pay for it and you don't have to." If you lose your phone, call up your bank and get it to close the account or stop the online access, advised Daugherty. "Our understanding is if you lose your phone, there isn't a lot of info they (thieves) will get."